One day while driving around the great city of Atlanta, the Wing Authority noticed that every few miles there seemed to be signs that read, “Hot Wings”. I decided to explore this further. Atlanta is hundreds of miles from Buffalo, New York, where the Buffalo wing tradition began all those years ago. Given the distance and what I know about Southern pride, the Wing Authority can’t help but wonder how faithfully the southern style is to the original Buffalo tradition. Clearly they’re really popular, based on the sheer number of wing joints. If Atlanta traffic prevents you from stopping at one, just wait a minute and you may get another chance. Two of these spots are across the street from each other on the east side of Atlanta in Decatur. What I’m talking about are the small wing joints all over Atlanta – the kinds of places that specialize in take-out and in addition to hot wings usually offer fish, fries, and maybe a Philly cheese steak. These are not family dining restaurants with appetizers and a draft beer list. The service is quick and prices are reasonable. I was delighted to find that each place had a hot flavor that was zesty and light, with heat around the level of Frank’s Red Hot. Southern folks can handle spicy food. Each batch saw a few pepper flakes swimming around in the bright red sauce. I did not come across a single batch of hot wings that was syrupy or dull. I would feel comfortable walking into almost any Atlanta wings joint and getting a quick Buffalo wings fix. What makes them Buffalo? First you have to select a sauce. Check out the menus. With this many options, the safest way to compare is to get the same flavor – HOT. It is worth noting that no menus listed any sauce named “Buffalo”. Is there a difference between Buffalo and hot? Are Hot wings always Buffalo wings? The Wing Authority believes that in most cases there is not a difference. Some chefs might boast a certain type of Buffalo sauce that coats wings and is not at all runny. 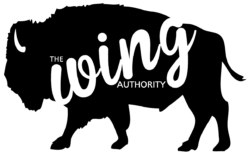 The Wing Authority believes the recipe is simpler, and that the Buffalo wing tradition is easy to follow. Atlanta proves that it isn’t hard to nail it: hot sauce, butter, and blue cheese. Even though I was told by one young lady at the register that lemon pepper was one of the most popular flavors sold, lemon pepper is most definitely NOT BUFFALO. It’s a dry rub and weird, quite frankly. It is missing the hot sauce, it is dry and too salty. Most places overdo it and all you can do is hope for a bold beverage to level out the sour and savory attack. But honestly, whether lemon pepper is delicious or not is not the issue. Lemon pepper is merely a ready-made seasoning for anything from fried chicken to catfish. It lacks the adventure and tradition of Buffalo wings. Not all hot wings may be Buffalo, but all lemon pepper wings are most definitely NOT BUFFALO. Some of my favorite saucy specimens were obtained from “Atlanta’s Best Wings”, a small place near a busy intersection in Decatur. The Wing Authority was extremely pleased to see blue cheese served with this batch, along with carrots and celery. TOTALLY BUFFALO. I want to give a special acknowledgement and Buffalo wings shout-out to my friends at Taco Pete in East Point. The hospitality, warmth, and of course the food there was phenomenal. We ordered up just a small order of hot wings and they did not disappoint. I had a great conversation with the grandson of Taco Pete himself, who said that the restaurant started as a taco stand but eventually began serving hot wings in response to overwhelming customer demand. He also gave me one of the best quotes the Wing Authority has ever heard: “Blue cheese is for wings. Ranch is for salads.” So classic. So delicious. SO BUFFALO. Atlanta does it right.